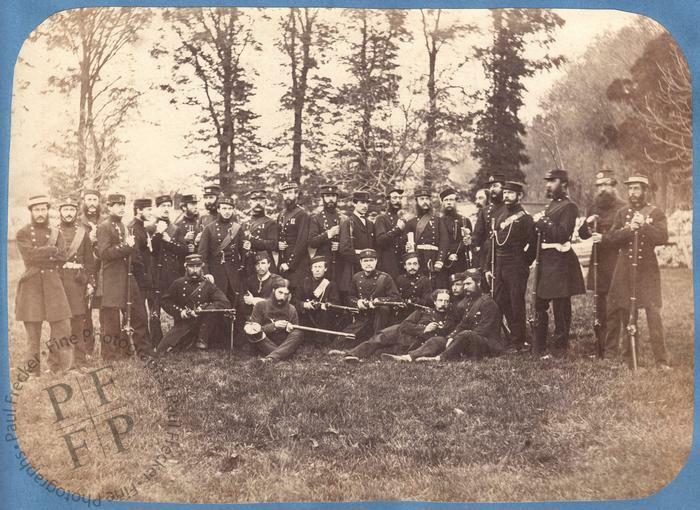 An albumen print showing various men who attended the School of Musketry at Hythe in the autumn of 1860. ‘The Volunteer Force was a citizen army of part-time rifle, artillery and engineer corps, created as a popular movement throughout the British Empire in 1859. Originally highly autonomous, the units of volunteers became increasingly integrated with the British Army after the Childers Reforms in 1881, before forming part of the Territorial Force in 1908. Most of the regiments of the present Territorial Army Infantry, Artillery, Engineers and Signals units are directly descended from Volunteer Force units’ (Wikipedia). Established in 1853 by Lord Hardinge, the Hythe School of Musketry was charged with maintaining the proficiency of the army in the use of small arms, support weapons and range management. ‘In June 1853 Colonel Hay arrived at Hythe, Kent, with a small staff of officers. On 1 August the first instructor, Colour Sergeant MacKay of the 19th Foot, was appointed. […] The first mention of the establishment of the School was in the Army List of 1854 when it was referred to as the School of Musketry. In September 1855 a Corps of Instructors was added to the establishment, consisting of 100 First Class and 100 Second Class Instructors who, as soon as they were sufficiently experienced (except for three who remained at Hythe), were distributed to Depot Battalions and Regiments as required. These men were the Corps of Instructors of Musketry, a misnomer as muskets were being withdrawn from service – yet the art of the use of long arms to this day is sometimes known as musketry’ (Wikipedia). Condition: the print is excellent condition, with very good tonal range. It is mounted on a bright blue album page, which presents a small amount of wear at two of its corners. Description: the print measures 5.3” by 7.4” (13.5 cm by 18.8 cm); the album page measures 11.4” by 8.7” (29 cm by 22.2 cm).